A friend of mine just held his camera up and went snap. Dancing wild. 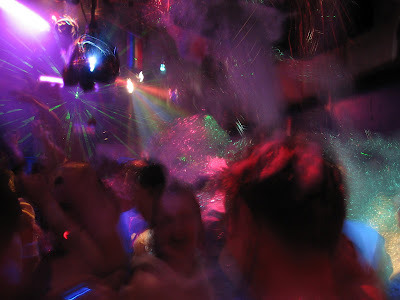 One of the foam parties at Rumor's Cabaret where suds flow from a machine near the ceiling. Foam events are a few times each year. Other times without the foam, but still lights, music and energy. It's almost too much. I'm not much of a bar person, but I sometimes go to the bar for exercise. Dancing can be some of the best exercise. Still, it's almost too crowded. Glad Washington State has made bar experiences smoke free, however. For conversation, forget it. When the loud music's going at least. I go to the sauna at YMCA for conversation where decibels are moderate. People often think of Y for exercise, but I think of the sauna which is more like a piano bar. A piano bar minus the piano and minus alcohol, where discussion can abound. There is exercise in various parts of the Y, but I usually get that elsewhere. I go to the Y like it's a piano bar and then I go to the bar like it's an exercise gym. Neither place I drink, except water. Don't mind paying a cover charge. How else can they keep it going if everyone was like me and just went for the pure water? Water is usually all that's available at Purple Church; another local dancing experience. Purple Church is actually in some one's house. He bought an old church. Compared to Rumors, it's kind of like the experience of eating an apple versus the experience of eating a candy bar. Purple Church being the apple. Less intense. Maybe only one string of dim Christmas lights. No "laser, video." Less decibels, but of all it could still be my favorite. The sweetness of an apple, but it's not a candy bar. I don't eat many candy bars, but after these experiences, from the drying heat of a Y sauna to the sweating heat of music, I often chug a lug a whole quart carton of decadently smooth chocolate milk. I have been to the Rumors club a couple of times and never went back the scene there was very intense and very frustrating at least for me not only was the crowd there huge "i mean shoulder to shoulder huge." The heat generated by all the club hoppers was unbearable not to mention the bathroom scene "Sooo, not for me!" To top it off "i am a smoker!" the smoke was almost too much to handle well at least back then it was... You'd almost think there was some sort of fire code violation...J/k...maybe it calmed down a few notches since then! The Outside of the club was more like a club for me you can hear the music loud a clear AND you can actually hold a "non yelling in your ear" conversation! I don't go to Rumors very often, but really love dancing at a place that's sometimes called the Purple Church. Less commercial, non smoky, non drinking, less couples and the whole room as one dance. There are some other dance venues in town that I go to also. Not bars, more like dance studios. One was in an aerobics studio for a while.